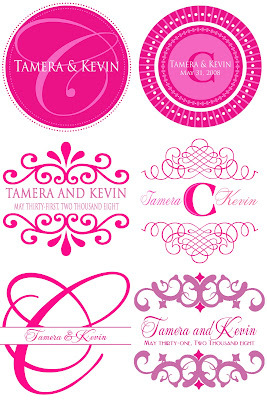 Below are some vibrant and fun monograms that I recently designed for Tamera & Kevin for their upcoming wedding in May of next year. The bride and groom selected an awesome color palette of varying shades of bright pink tones that I absolutely love! I created several different designs for them and these were my favorites. I absolutely adore the flirty, yet very elegant appeal of these monograms especially the two round designs on the first row. I cannot wait to see pictures of these designs in action after the wedding!